In MSM's libraries, you'll find superb collections, an inviting study environment, and friendly staff to help you. The two libraries occupy an entire floor of Andersen Hall. To get to them, take the elevator in the 130 Claremont building to the third floor, then turn right. The Evelyn Sharp Performance Library, located just outside the entrance of the Peter Jay Sharp Library, is where you’ll find performing materials for all of MSM’s larger ensembles, choruses, repertoire classes, and stage productions. The Peter Jay Sharp Library is where you go for everything else: printed music, books, recordings, magazines, digital resources, a silent study room, the computer lab, and copy machines. The Peter Jay Sharp Library has a rich collection of printed music, from solo repertoire to chamber music and orchestral study scores. It is particularly notable for its holdings of music of the late twentieth and early twenty-first centuries. The book collection centers around music–classical, jazz, and musical theatre–but branches out into other fields as well, including the other arts, and classics of fiction, poetry, history, philosophy, psychology, and more. Tens of thousands of CDs and DVDs are complemented by even more albums available online through our digital subscriptions. Recordings of many MSM performances are available on CD or online. PCs and iMacs are freely available on a first-come basis. Each is equipped with standard programs like Word and Excel as well as the software notation programs Finale and Sibelius. Print or photocopy for 5 cents per page (10 cents for color), or scan for free. Bring your own laptop or tablet and enjoy full internet access. Rotating exhibits highlight materials in the Library’s collections and the School’s history and musical endeavors. This free service allows you to borrow materials from other libraries. A librarian is on duty at the reference desk Monday-Friday 11–5. You should also feel free to visit the Library Director, whose office adjoins the main reading area. The Performance Library holdings include parts and scores for large ensemble works: orchestral, wind ensemble, brass ensemble, choral, jazz band, and complete operas. Complete sets of materials may be borrowed by enrolled Manhattan School of Music students with the help of a faculty sponsor. The librarians also supply instrumental audition excerpts to enrolled students and alumni for school and professional auditions. Orchestra part sets for over 1200 symphonic works and operas comprising almost every major orchestral work in the repertoire and much more. 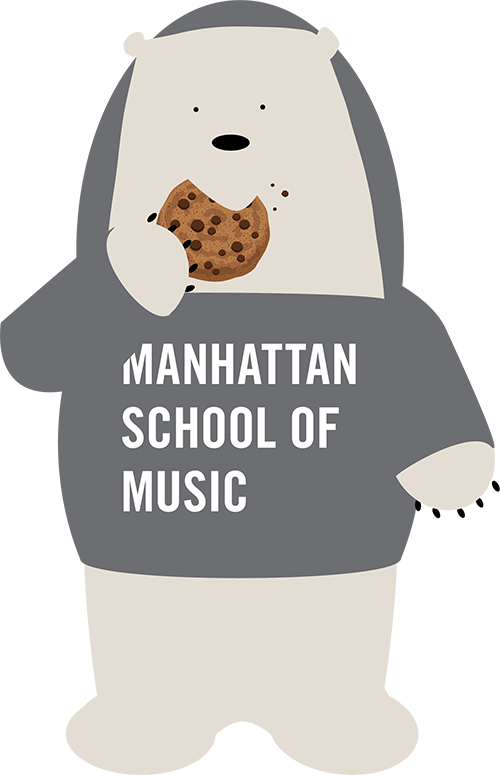 Materials are for use by Manhattan School of Music’s ensembles only. Students may borrow sets for on-campus readings and recitals with faculty sponsorship; for more information, contact the performance librarian. Reference Service: The Performance Librarian is available to answer questions relating to the acquisition of individual orchestra parts, rental part sets, hard-to-find orchestra excerpts, and concerto sets. Reference Service: The Performance Librarian is available to answer questions relating to large ensemble performance materials, for example, the acquisition of individual orchestra parts, rental part sets, orchestral excerpts, and concerto sets. Orchestra Excerpts/Perusal Parts: Perusal parts and excerpts can be requested by current students and alumni, either by visiting the performance library during open hours, or by sending an e-mail detailing the exact excerpts needed. The Evelyn Sharp Performance Library has Orchestra part sets for over 1200 symphonic works and operas comprising almost every major orchestral work in the repertoire, and much more.